Cross-border trade in East Africa has never been more efficient with the introduction of centralised digital systems that can be accessed by authorities across the region, to monitor the journey of goods and ensure all the necessary documentation is available. 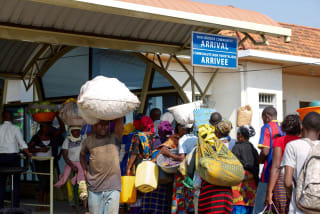 With the integration of digital technologies into East Africa’s border post operations, transit and clearance times for goods crossing borders have been significantly reduced, saving traders as much as €50 million annually. TradeMark East Africa (TMEA) has been leading efforts to increase the efficiency of cross-border trade in the region with the introduction of One Stop Border Posts (OSBPs) in 13 locations along the borders of Burundi, Kenya, Rwanda, Tanzania and Uganda between 2014 and 2017. OSBPs are designed to combine the activities of immigration, customs and other agencies on both sides of the border so that traders only have to go through border formalities once in each direction. Each OSBP has new office buildings for customs staff and clearing agents, parking yards, cargo verification bays, scanner and passenger sheds, and integrated ICT networks. The OSBP ICT networks are centralised to enable access and use of the relevant operational and management systems by the various government agencies, organisations and other regulators on both sides of the border. The systems are designed to remove paper-based transactions and instead offer digitalised services to facilitate more efficient movement of goods and people across borders. For instance, since 2015, all 24 government agencies involved in cargo clearance at Kenya’s port and border posts have been using the Electronic Single Window System (SWS) to digitally process trade transactions. The SWS has not only reduced transit times at OSBPs, but also facilitated international trade at Mombasa port (along with other digital systems that have been set up) – which, in addition to domestic imports/exports, serves Burundi, the Democratic Republic of Congo, Rwanda, South Sudan and Uganda. The time it takes for customs to process goods entering or leaving Mombasa port has more than halved, from 7 to 3 days, with the introduction of the SWS. With similar systems in use in Burundi, Rwanda and Uganda, traders are able to digitally submit regulatory documents at a single location. The information can then be shared and exchanged between different customs and border agencies, as well as with private sector stakeholders. “The SWS has tremendously improved clearance of transit goods by reducing lead times for customs clearance, as well as eliminating delays at the borders,” said Job Kemboi, Group Commercial Manager at Siginon Group, a transport and logistics company based in East Africa. To further enhance trade efficiency across East Africa, Kenya, Rwanda and Uganda have introduced the Regional Electronic Cargo Tracking System (RECTS). Using an electronic seal attached to the vehicle, RECTS enables the centralised tracking of goods across the region by transporters and revenue authorities in all three countries. Government authorities manage and administer the electronic seals at no cost to transporters and traders, to reduce the risk of theft, lower insurance premiums and improve profit margins for traders. Without government subsidies the seal costs approximately €1,060, which is what businesses in Tanzania and Burundi currently have to pay if they want the assurance provided by RECTS. However, the East Africa Business Council is engaged in ongoing discussions with both countries to persuade the revenue authorities to adopt RECTS for a harmonised system across the region. To reduce fragmentation in the produce market, a mobile-based platform is supplying vendors in Kenya with fresh fruit and vegetables and providing a steady market for smallholders. The new African Continental Free Trade Agreement (AfCFTA) is expected to be a game changer, boosting inter-African trade, spurring manufacturing, and creating economic opportunities. But for its benefits to be realised, the details need to be negotiated; and Africa's leaders need to commit to AfCFTA for the long haul.